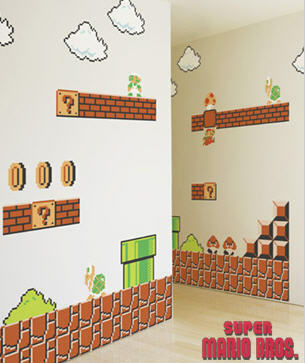 Nintendo Wall Decals turn your bedroom into the world of Super Mario Bros.
Never mind kids, I know a few adults who would love to decorate their walls to look like the inside of a Super Mario Bros. game with these Nintendo Wall Decals. Made with blik Re-Stik, the decals are movable and reusable (in case you have a change of heart and decide to relocate the decals to your kid’s room), and are based on the same 8-bit graphics of the original game. For $75, you get 36 decals. They also sell New Super Mario Bros. decals and Donkey Kong decals – directly on the Blik website. Secret Service Invisible 2-Way Micro Headset – the smallest headset in the world. A unique gadget was recently presented to the community. 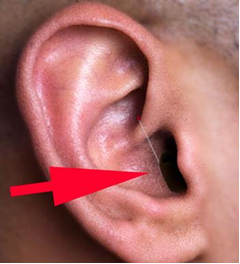 Now we can definitely call it the smallest in the world and almost invisible, because when you put the device in your ear only a very attentive and too curious person will be able to notice it. You need a mobile phone to plug in the wireless transmitter. In that way you will be able to receive or send any kind of information. So, let’s find out who may need such device. At first, this can be a nice politicians’ helper. Their speech will be perfect: no missed dates, numbers or any other information. No one will notice or hear this prompting. Then, such a helpful device will be very handy for spies during a very important operation. Any person, on a date or ? business meeting, for example, can impress everyone around. No one will know that the necessary information and extraordinary facts will be prompted via Micro Headset. Finally, any student dreams to have this gadget in his ear during exams. This device is excellent, because it can’t be heard from outside while using it. Anyway, you can regulate the volume. Speaking about all the advantages of the gadget, I must mention that it is not widely available. Its price is 9.95. I think it is too much for the secret gadget, including the fact that a lot of people already know about it. But, on the other hand, sometimes the aim justifies means.